Finally we are getting some good news. At least most people will consider it good news. Republican Presidential candidates hoping to run against Obama on “weak economy platform” might not happy with the news. The change in total nonfarm payroll employment for November was revised from +100,000 to +157,000, and the change for December was revised from +200,000 to +203,000.. So what accounts for the increase? As the BLS states, large gains were widespread – services, hospitality/leisure, and manufacturing. But overall positive effect compared to what was expected and to what we’ve grown accustomed is strongly due to two factors we didn’t see. We didn’t see reductions in government employment dragging down the total numbers. I’ll have another post on that later today. The other effect is that the weather was nice – the exact opposite of last January (2011) when the weather adversely affected the numbers. Nonetheless, a solid increase is a solid increase and something to feel good about. But in keeping with my skeptical self, it’s also very important to not declare victory yet. We’re not out of the woods by a long shot. I can think of four reasons right away. Job growth started picking up early last year, but then the economy was hit by a series of shocks (oil price increase, tsunami in Japan, debt ceiling debate) – and now it appears job growth is picking up again. This is the third or fourth time in this “recovery” that it appeared employment would finally be accelerating into the kind of “V-shaped” recovery we really need. Each time before, something (often politics) interfered. A second reason for caution involves both the employment-population ratio and the labor-force-participation rate. Both rates are at lows we haven’t seen for 30 some years. Both ratios indicate that large numbers of people have left the labor force and simply aren’t looking for work. If they change their minds and start to look for work, then the unemployment rate could easily begin rising again as the denominator of the unemployment rate rises faster than employment (the numerator). A third reason is that there are still too many unknowns on the horizon and most of them carry downside risk. The UK and the Eurozone continue their self-inflicted austerity march into recession and flirtation with banking and default crises. House prices have continued to decline, threatening the ability of households to sustain increases in consumer spending. And there’s always the completely unknown. Twelve months ago nobody would have considered the risk to economic growth from an earthquake that created a nuclear disaster. 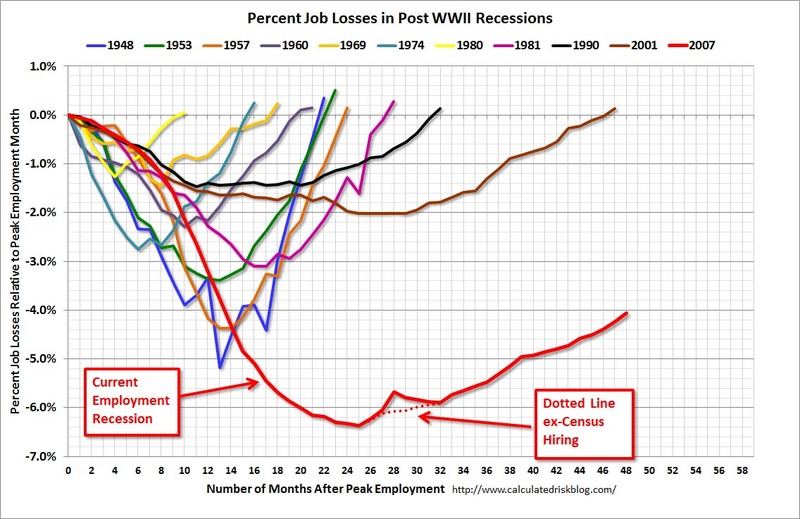 … third graph shows the job losses from the start of the employment recession, in percentage terms. The dotted line is ex-Census hiring. This shows the depth of the recent employment recession – much worst than any other post-war recession – and the relatively slow recovery due to the lingering effects of the housing bust and financial crisis. We are far, far from leaving this employment depression behind. Dean Baker of the Center for Economic Policy and Research cautioned today that, while it appears that we are on stronger path, it is still too weak. 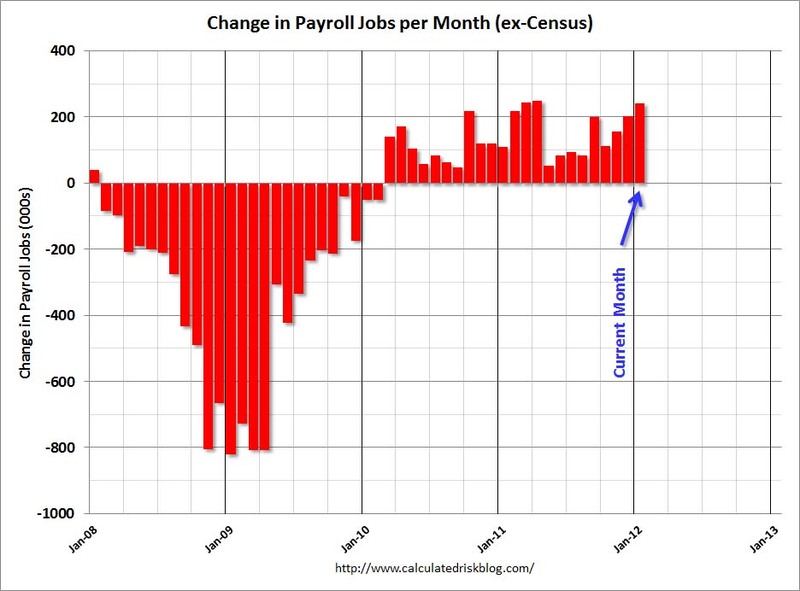 January’s numbers seem strong only because we have grown accustomed to such abysmal recovery for the last 2-3 years. Even at the pace January showed, it will still be 2020 before we regain full employment. That’s 8 years away – 100 months. Government and central banks easily lose focus on growth in a period that long. Congress and the President, while returning to jobs now in this election season, have already shown that they couldn’t sustain a focus on job growth last year as they turned to imaginary concerns over government debt instead. We have a long way to go. We should be running but we’re only walking. Nonetheless, at least we’re walking forward now instead of backwards they way we were in mid-2011. ← Does Anybody Understand Debt?